Want to get the most out of your VW Transporter? Read on to find out how! Enough containers of the right size must be provided to carry the user’s tools, accessories and spares. The racking must be able to store everything in perfect order. Safety in operating the van and in carrying cargo must be guaranteed. Part of the cargo space must be configured as a workshop. As we can see from the photos below, and as we can read in the following paragraphs, the Syncro installation team had no trouble fulfilling all these objectives in this Volkswagen Transporter. 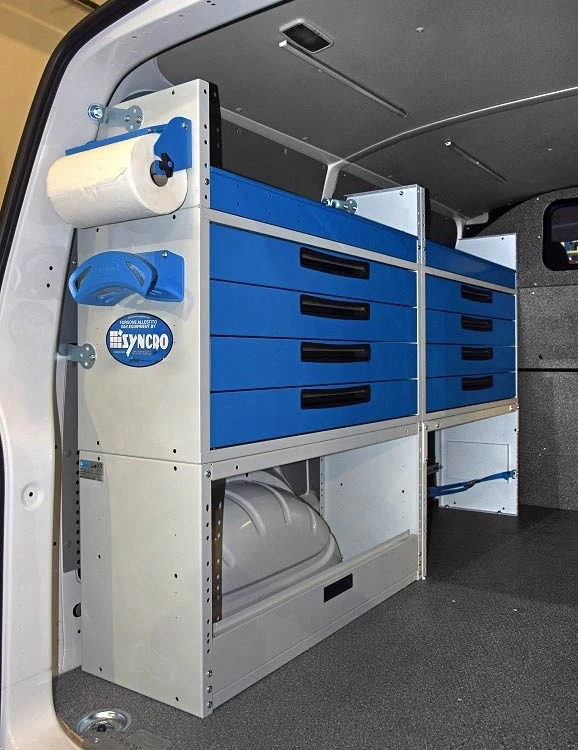 Syncro’s new marble-look surface is a key feature of this Transporter’s cargo compartment. The owner chose to cover the van's floor and the bulkhead with made-to-measure marble-look plywood liners. This material offers a number of benefits. It provides a perfectly flat floor surface with a bright, attractive appearance and is far more resistant than the van’s original sheet metal floor. Syncro's marble-look plywood liners also afford a good grip and are superbly easy to clean. On top of this, between one clean and the next, the pattern of spots effectively hides small marks and defects! The interior walls and doors of the van are lined with pre-painted steel panels. The most important module in this racking system for a plumber’s Transporter is the drawer cabinet, as the photos show. 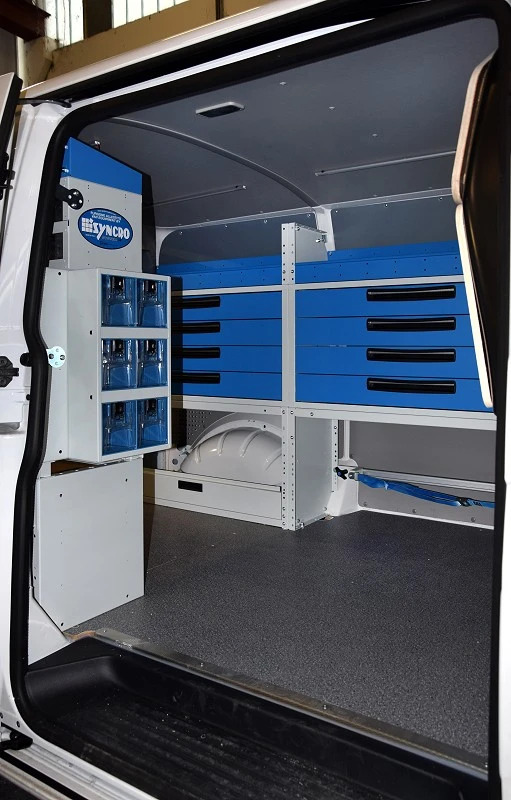 This Syncro van racking system consists of a number of basic, modular cabinet types, combined in various ways to create a fully customised configuration to meet the customer’s needs. Syncro’s metal drawers are available in different heights and depths to match Syncro’s shelves, cupboards and other van racking products. 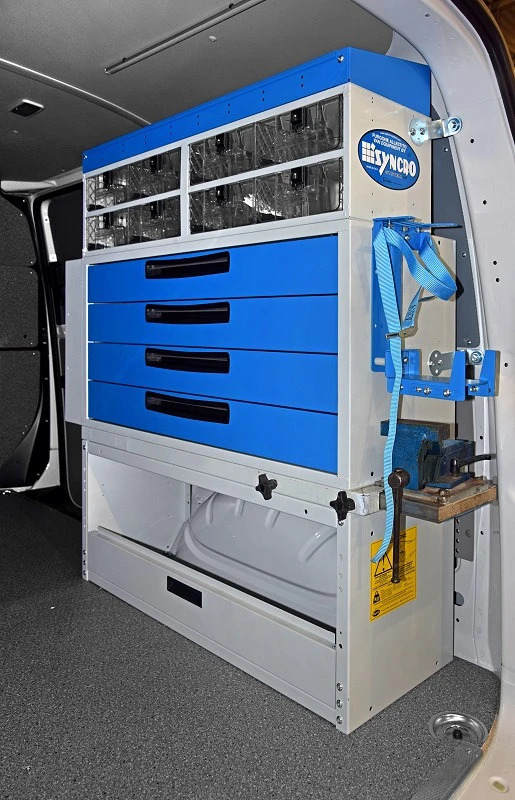 This installation includes a total of three drawer cabinets with twelve drawers, installed on the left and right sides of the van. Each drawer slides out all the way on ball-bearing runners and is fitted with a plastic handle recessed in the front panel plus non-slip mats and metal space dividers inside. The configuration is completed by partly closed wheel arch cabinets, a case transport compartment with retaining straps, three shelves including a top tray and, finally, two cabinets of Multibox clear plastic containers. These are perfect for storing small spare parts and sundries. Because they are made from transparent plastic, you can see immediately what is inside and avoid wasting valuable time searching for what you need. They also make stock maintenance so much easier as you can see instantly what items are running out and need to be replenished. The racking system in this particular Transporter deserves a chapter dedicated to accessories. 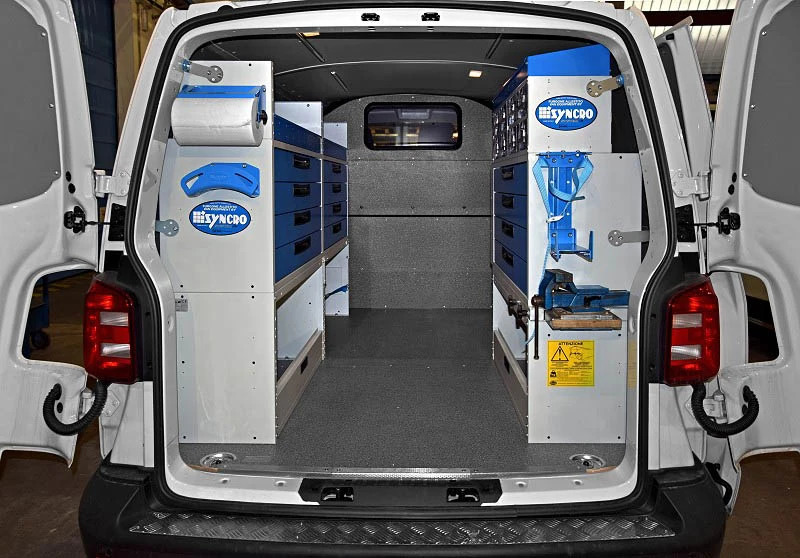 Syncro knows that accessories are not mere “extras” but of fundamental importance, as they can change the way in which a vehicle is used and make a vast difference to the working methods of its owner, greatly benefiting his professionalism. A bar and strap cargo retaining system installed in the open, floor-level cabinet, designed to store all kinds of cases along with other items, effectively secured for transport..